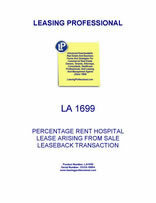 This agreement is designed for a lease of a hospital arising from a sale leaseback financing transaction. 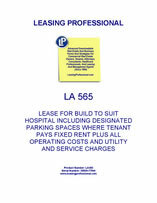 The lease provides for payment of fixed and percentage rentals by the tenant, the operator of the facility. This agreement is designed for a lease of a medical center hospital to the operator tenant. The lease provides for payment of fixed rentals by the tenant together with increases of operating expenses over the stipulated base year for the lease. Rules and Regulations Exhibit is included. This lease form is designed for a build to suit transaction for a new hospital to be occupied and operated by a doctor group tenant. The premises will include a specified number of parking spaces which may be used during the term of the lease at no charge by the tenant doctor practice group. The document contains a work letter exhibit with extensive provisions concerning construction of premises, including the preparation of improvement plans, tenant improvements, change orders, substantial completion, tenant caused delays, punchlist items and parking lot improvements. After completion of construction, the tenant maintains the entire premises. The landlord has no maintenance obligations during the term of the lease except for maintenance associated with a taking or a casualty. This document contains the following exhibits: Guaranty Of Lease With Maximum Dollar Amount For Individual Physicians Who Make Up The Tenant Doctor Practice Group; Guaranty Will Terminate After Tenant Achieves Certain EBITDA Revenues Which Are A Multiple Of The Rent.